For our CROCT presentation to the City of Northfield PRAB tonight, Marty Larson and I first took them through some 2014 highlights and then followed with a Q&A. I think it’s safe to say they were happy with what we’ve done thus far. 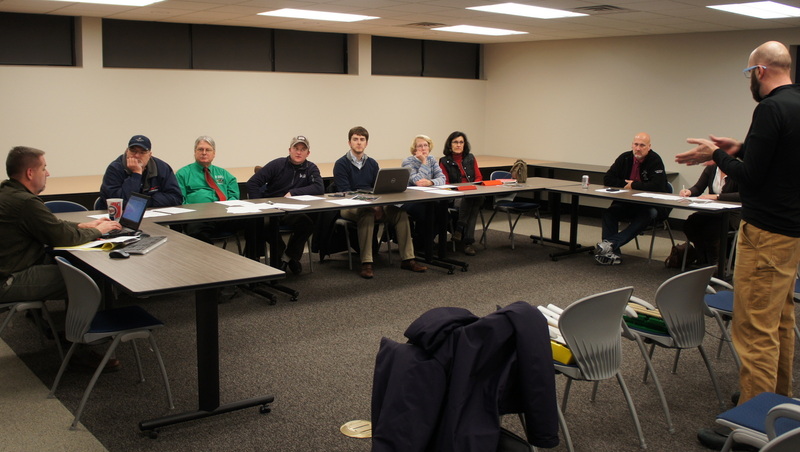 Marty Larson and I made a brief presentation to the Northfield Park and Recreation Advisory Board (PRAB) last night. They seemed to like our plan to create river bottoms mountain bike trail in Sechler Park, and seemed open to exploring the possibility of a trail in Roosevelt Park and Roosevelt Ridge Park. They also wondered if Odd Fellows Park, site of a new dog park, might be a park that could accommodate both a trail and a bike park/pump track. We were asked send a formal letter of request to the Parks staff requesting a formal agreement between CROCT and the City, starting with permission to work on a trail in Sechler Park this spring. Staff will take that request to their weekly staff Development Review Committee (DRC) meeting and then put it into an upcoming City Council meeting packet, hopefully with a recommendation that the Council direct the PRAB and the staff to work with CROCT on implementation.